Denver alt-hip-hop group Flobots bring new songs from their upcoming album to Velvet Jones on Friday night. For politically charged Denver six-piece Flobots, there’s still plenty to sing about. With their 2008 anthem of hope, “Handlebars,” the band catapulted themselves into the upper echelon of modern day “movement musicians” alongside bands like Rise Against and The Coup, performing in and around the 2008 Democratic National Convention and calling out for change throughout the presidential race. 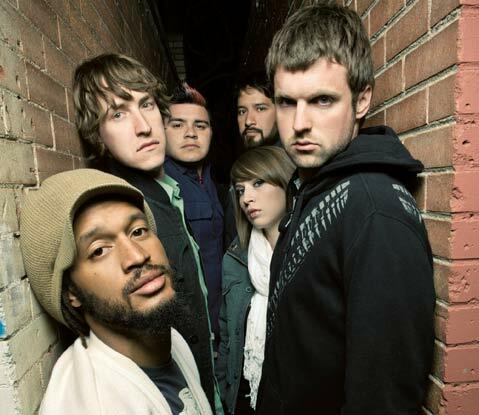 Musically speaking, Flobots exist somewhere between hip-hop and alt-rock, blending out-of-the-ordinary instruments like viola, cello, and trumpet with high energy, fast-paced lyricism and pulsating beats. On the band’s debut release, Fight With Tools, hard-hitting rhymes about terrorism and homelessness (“Stand Up”) played alongside building rock-outs about anger and frustration (“Mayday”) to moving effect. Today, the band is wrapping up their soon-to-be-released follow-up, tentatively titled Survival Story, which they will play Velvet Jones in support of this week. I recently spoke to lead emcee Jonny 5 about the new record, the band’s vision, and what Obama’s election means for it all. How has your sound changed since you wrote Fight With Tools? Listening to this album compared to the last one, I think there’s a lot more layers this time-not just in the music, but in the content. 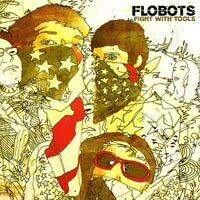 I think Fight With Tools was an album that was very emblematic of last year. There were a lot of people on a similar page; they weren’t sure where the country was going, they weren’t sure about the direction of things, and they were really upset about things like the war in Iraq and the Bush presidency. So we had these slogans that we were feeling, that other people were feeling, and they kind of hit everybody at the same time. This time around, Obama’s president. What does that mean? Does that mean everything’s good? No. There’s still plenty of things that we have to work on, there’s still plenty of stories that we have to tell. [This album] is much less about slogans and much more about stories-our personal stories, which people didn’t really get a sense of on our last album. I think there’s just a lot more depth- a lot more depth and a lot more layers. Would you say there’s a theme to the new album? The new album is absolutely tied together in many ways. It may or may not feel that way on first listen because we tried to tie it together subtly. But one of the questions we’re asking-we almost titled the album this-is, “Who will turn the tide?” On a kind of metaphoric level, and when you have a big issue like climate change, [you want to know] who’s going to actually create that tipping point where we start changing how we live. We all contribute to it, but who takes that first step? Also on a personal level, if you realize something about yourself that needs to change, who’s going to be the person who makes that change? What was it like to work with an acclaimed producer like Mario Caldato Jr.? When we were first talking about this album, we said, “Look, we don’t want a producer. Let’s just do what we did last time.” If it ain’t broke, don’t fix it. But when we saw the opportunity to work with Mario, we thought it was worth a try, and it really paid off. He was so laid back in the process. [Laughs.] We weren’t worried about him stepping on our toes. If anything, he was the one saying, “Hey, chill out. You don’t need to do 17 takes of that. The first 12 takes were good, and we can pull something from that.” I think we all feel really good about what he’s done with the album. Flobots play Velvet Jones (423 State St.) this Friday, November 20, at 8 p.m. Call 965-8676 or visit ticketweb.com for info.